This recipe is shared from Becca at Amuse Your Bouche. She specializes in vegetarian cooking. 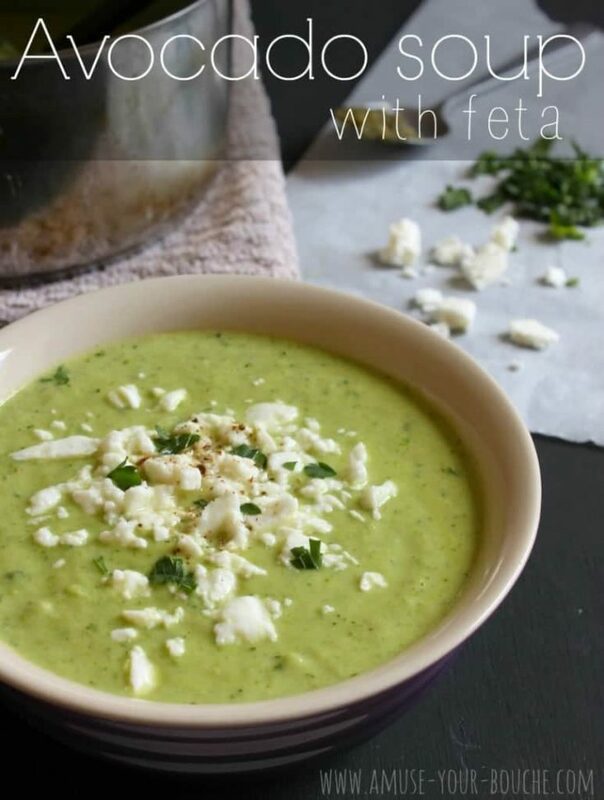 Today I’ve got an incredible recipe for you – avocado soup. With feta. If you like this soup, you’ll love these other avocado recipes like brie and avocado toasts or my avocado poppers. Heat the butter and oil in a saucepan, and add the spring onions and baby gem. Cook for a few minutes until the onions are fragrant and the lettuce is just beginning to caramelize on the edges. Add the next 6 ingredients (avocado to pesto), and bring to a gentle simmer. Use your wooden spoon to mash the avocado a little. After about five minutes, remove from the heat and use an immersion blender to blend the soup until smooth. Be thorough - you don't want any lumps remaining. Season to taste, and return to the heat if necessary. Serve topped with the feta cheese and, if desired, more black pepper and parsley. Oh I’m definitely making this tomorrow night. Looks amazing Becca! The perfect recipe for the abundance of avocadoes i have in the pantry that need to be used up before we go on holiday in a few days’ time. Off to Greece and I can’t wait! And hi Jessica! Just found your blog through Becca’s site. Love your 52-week no-repeat meal plan concept. Hope you’re having a great time in NYC! Thanks Lisa! Becca’s recipe looks amazing, doesn’t it? We’re having an amazing time in NYC even though my feet are so sore and I can’t possibly unwind early enough to go to bed at a decent hour. I’ll have to check out your blog as well as soon as I get settled back at home later this week. Yummy avocado + creamy soup = 1 of my most favourite things. This sounds delicious! I love avocado and feta cheese.